MotoAmerica Twins Cup & Stock 1000 Are "The People's Race Classes"
MotoAmerica has a lot of different race classes, and there’s even a couple for the Average Joe. 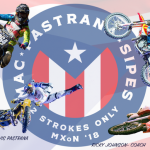 The MotoAmerica Twins Cup and Stock 1000 classes are where you can go out, have some fun and not have to worry about keeping up or getting run over by the Roger Haydens, Toni Elias and Josh Herrins of the world. One of the missions of MotoAmerica Twins Cup and Stock 1000 – two brand-new race classes for 2018 – is to attract road racers who aren’t, or haven’t recently, been regulars in MotoAmerica. We’ve already documented the success that Ghetto Customs/Suzuki rider Chris Parrish and Weir Everywhere Racing/BMW rider Travis Wyman have already had in Twins Cup and Stock 1000, respectively. Parrish, who is brand-new to MotoAmerica, currently leads the Twins Cup Championship. Wyman, who has occasionally raced in MotoAmerica in the past but not on a regular basis, is second in the point standings in Stock 1000. At each round of the MotoAmerica series, there are new entries in Twins Cup and Stock 1000, along with new faces and some faces from the past in the paddock. At Road America, it was great to see Oklahoma-born Dustin Dominguez again. Dominguez formerly competed in AMA Pro Racing’s SuperSport class, and he also raced for Aprilia HSBK Racing in Superstock 1000 during MotoAmerica’s inaugural season. 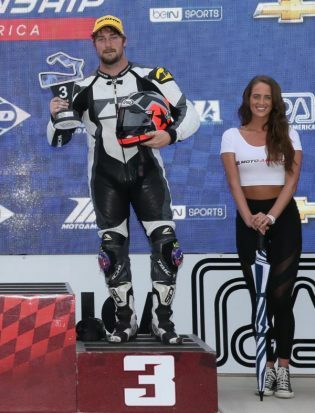 This past weekend, Dominguez was at Road America, and he competed in both Twins Cup and Stock 1000, making him the “poster rider” for what the two race classes are all about. 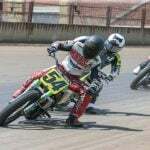 Dominguez is one of the fast guys in the Central Motorcycle Roadracing Association (CMRA), which sanctions races at tracks in Louisiana, Oklahoma, and Texas. He is a multi-time class champion in that regional series and is currently leading the Expert Overall Championship by one point over AGVSPORT America/MonkeyMoto rider Jay Newton, who also currently competes in MotoAmerica’s Liqui Moly Junior Cup class. In Friday morning’s Twins Cup free practice 1 at Road America, Dominguez was the fastest rider on the track. He was fastest again in Twins Cup qualifying, which earned him the pole position for Saturday’s Twins Cup race. Aboard his friend’s SV650, Dominguez finished third in the eight-lap feature race and stood on the podium. He couldn’t attend the post-race press conference because he needed to participate in Stock 1000 provisional qualifying aboard his Kawasaki, which was scheduled for right after the Twins Cup race. On Sunday morning, while Dominguez was preparing his Kawasaki for Stock 1000 final qualifying, he commented on his podium finish aboard his friend’s Suzuki. 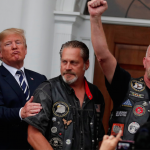 “Maybe I would have won that race if I’d at least changed the oil on that bike, since it hadn’t been done for at least two years. But I just didn’t have time,” Dominguez said. He also added that he’d probably put a new engine in the bike before he races it in MotoAmerica again, which depends on if he gets some funding to continue. In Stock 1000 final qualifying, Dominguez put his Kawasaki in the fifth position on the starting grid, and he finished fourth in Sunday’s Stock 1000 race, just missing out on his second podium result for the weekend. 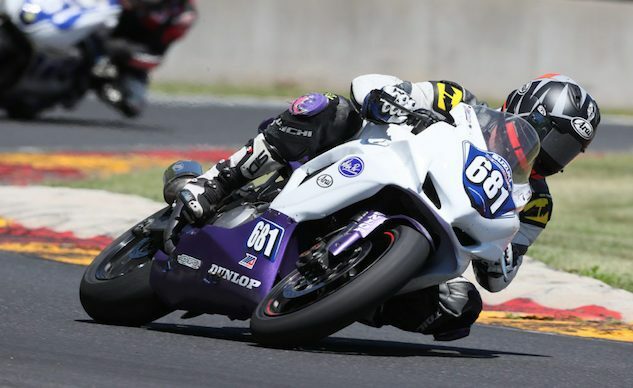 All in all, Dustin Dominguez had a great weekend at Road America. 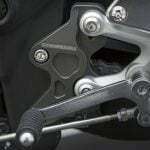 He earned $750 in MotoAmerica purse money, and if he applies for manufacturer’s contingency money, he will earn another $3000 in combined support funds from Suzuki and Kawasaki. And, hopefully, the exposure he gets from racing in MotoAmerica will garner him some attention from sponsors. Dominguez would like to continue racing in MotoAmerica, and he certainly showed that he’s got the talent to compete for podiums and wins. Not bad for a guy with a 15,000-mile streetbike that he borrowed from a friend and a second bike that was sitting in his garage at home. Now, about that oil change on the SV650.